All Sharpening received on Monday, April 8 through Saturday, April 20 will be ready for pickup on Tuesday, April 23. Sharpening received on Monday, April 22 through Saturday, May 4 will be ready for pickup on Tuesday, May 7. View Cart “Dovo111 6596½” Dog Grooming – Scissors” has been added to your cart. ZT and Emerson are back for more with the 0630. The powerful upswept tactical blade, excellent for slicing cuts, is made of Crucible S35VN. S35VN is tough and chip resistant and enables ZT to sharpen the blade to a razor edge. When it’s time to re-sharpen, S35VN makes that easier, too. Of course the 0630 features the patented Emerson “wave shaped feature” that enables the knife to be opened as it is removed from the pocket. By the time the knife has been fully withdrawn from the pocket, the blade is deployed and ready for use. A small wave-shaped tab on the top of the blade is built to catch on the pocket seam, opening the knife as it comes out of the pocket. This Emerson instant-open feature is a favorite among military, rescue, and law enforcement knife users. The 0630’s handle features a G-10 front scale with a titanium back. 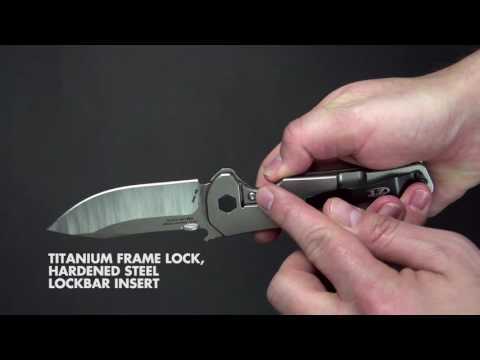 A titanium frame lock with hardened steel lock bar insert ensures lock up security. The reversible pocket clip lets you carry comfortably left- or right-handed. This orange G-10 handle edition of the 0630 is a sprint run, built in limited quantity. Get special offers & updates from us!